When I first heard about the ad grant, I thought, ‘How in the world does not every nonprofit know about this amazing grant from Google?’ Ten thousand dollars a month in advertising is such an amazing opportunity for every nonprofit. Free money? There’s no such thing. Yet in our webinar with Classy Certified Partner, Community Boost Consulting, a digital marketing agency, Co-Founder and CEO Cameron Ripley informs us that “Google is a caring company,” and that it’s in every qualifying nonprofit’s best interest to take advantage of this incredible grant. Google Ad Grants awards advertising dollars to nonprofits so they can leverage free advertising on Google AdWords. In this webinar, Cameron Ripley and Chief Marketing Officer Chandler Perog outline Google Ad Grants tips and tricks gained from their years of experience working with organizations to expand their impact. 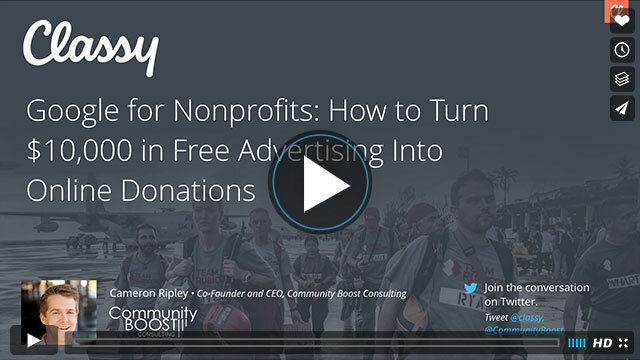 Check out the full webinar on Google for nonprofits below to find out how to get up and running with your Google advertising grant as soon as possible. For a sneak peek of what we learned, read on for a few key takeaways from the webinar. Certain institutes are not eligible, such as: governmental entities, hospitals, medical groups, schools, childcare centers, and academic institutes. Not sure if you qualify? Google.com/grants has the full details about who they will and will not accept. Is This Really Going to Impact My Bottom Line? When you increase top of funnel quality traffic to your website, the results trickle down to increased onsite engagement and increased conversion quantity for both email subscribers and donations. But the beauty of Google Adwords is that it’s not just casting your net into the great internet abyss and pulling in any visitor. It allows you to attract qualified leads through specific keyword research and ad spending. This means that the people who land on your page are likely the ones who will be genuinely interested in getting to know more about your work. And when you have more qualified visitors to your page, you’re bound to see your conversion rates skyrocket. Take Wounded Warrior Homes for example. They took advantage of Google Ad Grants in 2015 for the first time and saw incredible results. 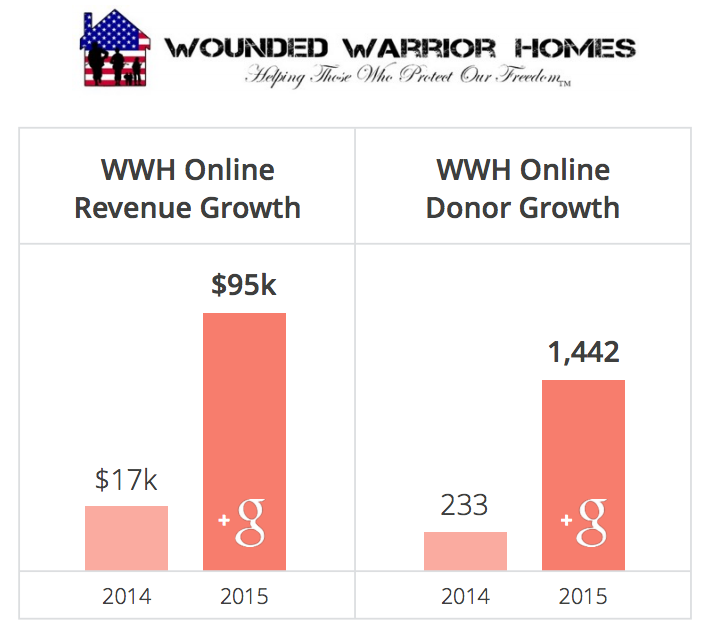 They increased their online revenue by 458 percent and online donors by 518 percent. It doesn’t end there. Google’s monthly grant allows you to continue to use this ad spend to attract new community members. And that’s exactly what new visitors have the potential to become—lasting community members. After a Google advertisement brings a visitor to your site, you have an opportunity to steward this person into an avid supporter. Community Boost recommends focusing your time and energy into scaling quality traffic with measurable incomes, such as growing your email subscriber list or increasing program inquiries. This will help you develop lasting relationships and provide each individual with tailored opportunities to engage with your organization. Perhaps they’re not in a position to donate now but would like to fundraise instead. Maybe they’ll attend an event and eventually become a volunteer. As their relationship with your organization grows over time, these community members can ultimately become recurring donors and superstar supporters that help grow your organization year over year. Google Ad Grants is not a short term fix for your donation problem. It is a long-term solution to help systematically bring in new donors every single month. Chandler also stresses that it’s up to each organization to use their advertising grant wisely to maximize its impact. In order to take full advantage of this opportunity, Community Boost outlines several pro tips that will help you create a strategic plan for your spending. Be a certified 501c3 or have valid charity status outside of the U.S. This post was originally published in 2016 and has been updated to include current Google Ad Grants information.